We’d love your help. 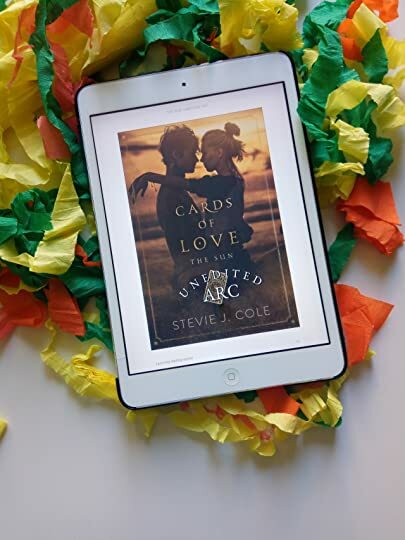 Let us know what’s wrong with this preview of Cards of Love by Stevie J. Cole. The cliche in love stories is that the good little rich girl falls for the poor bad boy with tattoos. The glamorous prom queen gets knocked-up by the swoon-worthy tattooed god who smells of leather and exhaust from his motorcycle. Elias Black may have had a sleeve of tattoos and grown up on the wrong side of the tracks, but he didn’t have a t The cliche in love stories is that the good little rich girl falls for the poor bad boy with tattoos. The glamorous prom queen gets knocked-up by the swoon-worthy tattooed god who smells of leather and exhaust from his motorcycle. I noticed there are many books in this series by different authors. Can someone explain if there is a reading order? Are they interconnected? Will they all be released in October? Thank you!! Mishelle How can i find the whole series pleasd? If you like it, you would probably enjoy this book. Virgin hero, who saved all his firsts for his girl. I’ve read a few Stevie J Cole novels over the past couple of years and while I enjoyed each and every one of those love stories none of them have moved me as much this book did. This story was as simplistic as any love story could be and that is what made this so GREAT. It’s a tale of two people that weathered through childhood, adolescence, bias, judgement and overbearing parents. And through it all their friendship only got stronger. Distance nor preconceived judgments could never hold a candle to the truest of loves and that is what Sunny and Elias shared. Sunny was a character aptly named. Her personality and disposition was a full manifestation of the name she was given. Raised to be kind, caring and good that was who she was her entire life. And giving a foster boy from an undesirable family situation a hand in friendship was what she was raised to do. So she did just that. She became his sun and he, with his dark and broody persona, became her moon. Elias and Sunny were total opposites, from their upbringing to their personalities, but they balanced each other in a way that no one could see or understand. As the years pass, so much gets in the way of them just being free to be together as friends or anything more. That level of friendship and their connection was bound to strengthen, evolve and become so much more and it did. It was inevitable. I can’t even describe how I feel right now. I’m truly moved by the characters and their journey to getting the happily ever after they fought so hard for. Loved it soooo much. No manwhore jerk. Light a candle to chase away the darkness. All Elias Black needs to let go of his bitterness and dark stains on his soul and his name, is a ray of sunshine- Sunny Ray Lower. It's insta-connection when she sees him for the first time at 8 years of age. when God made him he wasn’t exactly sure what color eyes a boy named Elias Black should have, so he dipped his paintbrush in a few colors and swirled them all together. Had God asked me, I would have told him to make that boy’s eyes black like his Light a candle to chase away the darkness. All Elias Black needs to let go of his bitterness and dark stains on his soul and his name, is a ray of sunshine- Sunny Ray Lower. when God made him he wasn’t exactly sure what color eyes a boy named Elias Black should have, so he dipped his paintbrush in a few colors and swirled them all together. Had God asked me, I would have told him to make that boy’s eyes black like his name to match the storm cloud that seemed to live on his face. A beautiful, very thought provoking story about tender love and Pinky promises that hold these two beautiful hearts together. The world pelts them with arrows of anger, hatred, prejudice towards them, but their souls are locked together like the Sun & Moon on their rings. The moon and the sun. The first star-crossed lovers doomed to an eternity of almost. Love triumphs but at extreme cost !! It's not just a mere coming-of-age story about pubescent love which takes root in a tree house and ends up in a trailer park. No, it's more than that. It's a dialogue that needs to be started about unconditional love amongst Human beings of any gender, race or religion. Could be a pastor's daughter or sheriff's daughter. Could be a rich elite kid or one whos been bumping arpund from foster home to foster home. A girl with a heart of gold & water-colored-by-God eyes. boy .or just simply two boys who fell in love. “You shouldn’t judge a book by its cover.” adults keep parroting this adage to kids but they fall short on walking their own talk sometimes. 4 friends, who face daily challenges growing up. High school bullies, mean girls, class divide, popularity contest, cool kids, outcasts and then there's parties where alcohol dulls their senses and major upheavals happen as a consequence. My father had forbidden me from being with the person I loved and society had forbidden Brandon from loving the person he wanted to. Life didn’t seem fair. To be honest, the older I grew, the uglier life seemed. I loved the premise, though I'm not a fan of young HS romances, I couldn't put the book down. It's written seamlessly and effortlessly. The language was not unnecessary flowery but was fittingly teenage worthy simplistic. Their young lives had simple problems and easy solutions. There's loads of teenage drama and inconsequential dilemmas, about hooking up with hottest guy, one upping the meanest girl, making other jealous and eating greasy fries at a local shack or showing up at the happening parties by sneaking out at night. In side characters, Brandon touched my heart the most. I cried for him a lot. Beautiful trapped soul just aching to live free. Such an honest and wonderfully written book about what it is to become an adult. No matter how you slice it, high school is hard. Rumors, lies and misunderstandings all shape Elias and Sunny's relationship over the years. I adored Elias Black and would very much like more of their story. I highly recommend this to anyone who loves YA! CAN I RATE THIS MORE THAN 5 STARS? I usually steer clear from the YA genre but damn, I was bewitched by Stevie J. Cole's book. Sunny and Elias was just the right cup of tea for a premise that was between borderline young adult and new adult fiction. I wasn't expecting this to be amazing and well-written. It made me happy, cry and scream. This book, maaaaan. I can't give justice to just merely expressing it through making a damn review. When I was finished with it, I was at l CAN I RATE THIS MORE THAN 5 STARS? I wasn't expecting this to be amazing and well-written. It made me happy, cry and scream. This book, maaaaan. I can't give justice to just merely expressing it through making a damn review. When I was finished with it, I was at loss for words. I got so attached between Sunny and Elias that when I was done, I felt like a needed time to pull my composure back together. It affected me so much and tho I've finished this around December last year, I'm posting this on 2019 instead. And my gosh the angst... I can't even. I'm a big fan of some angsty, groveling hero and we get everything in this book. This may be one of the best YA book I have ever come across with, yet. Elias, welcome to my worthy-hero-collection. You are certainly most welcome. This was an absolutely brilliant read. From start to finish I was in love with these characters. I only wished and hoped for the best for both Sunny and Elias. Sunny and Elias were complete opposites and came from different backgrounds. However they knew they loved one another and were destined to be together. This was a fabulous story for me. I couldn’t help but love the two main characters. Life isn’t easy for them but fate seems to be on their side. This is a beautiful well written story for t This was an absolutely brilliant read. From start to finish I was in love with these characters. I only wished and hoped for the best for both Sunny and Elias. This is a beautiful well written story for the romance lovers of any age. I highly recommend you read it. "I had told him I was too good for him when if anything, that boy had always been too good for me." "I was the sun and he was the moon and while we may share the same sky during the early hours of dawn, "I had told him I was too good for him when if anything, that boy had always been too good for me." "I was the sun and he was the moon and while we may share the same sky during the early hours of dawn, we would never be close enough to matter." Tugging on my heartstrings, Sunny and Elias had a love not often found, it seemed to transcend all people, places, and things, but in a super judgy small southern town, the two were never meant to be in everyone else's eyes. Plenty of hysterical moments with a host of vivid and lovable secondary characters, that I just fell head over heels for!! My heart broke in so many places as they trudged through trying to stay apart, but what came after was nothing short of poignant, emotional, and brought me to tears in the best way possible. This is zooming to my Top Reads of 2018 list and I thank the Author for providing a copy to review!! A simply gorgeous, memorable, uplifting story I won't soon forget. "There were not enough days in a lifetime to grow tired of the way he felt like a sunrise and sunset all at the same time, warm and comforting. He was the promise of a new day and the possibilities of tomorrow." Isn't the cover just so pretty it's such a great representation of the characters and the story. Sunny and Elias stole my heart just as quickly as they stole each others. A young girl a young boy an innocent friendship that will make you believe in soul mates. The words in this story and the way it's written wrapped around me like a warm fluffy blanket insulating me from harm. A forbidden love affair that spans years, the cliched bad boy and the good girl but there is nothing predictable about th Isn't the cover just so pretty it's such a great representation of the characters and the story. The words in this story and the way it's written wrapped around me like a warm fluffy blanket insulating me from harm. A forbidden love affair that spans years, the cliched bad boy and the good girl but there is nothing predictable about this story. You know a fall is coming but you pray for the sun and the moon to be together. "The moon and the sun. The first star-crossed lovers doomed to an eternity of almost." There are so many quotes I could use that sum up this story and so much I could say about how I felt whilst reading. I felt the joy of them together I felt the pain of their separation but what I always felt was love. I swear I'm not biased. Hear me out before you judge my version of sloppy tongue kisses. 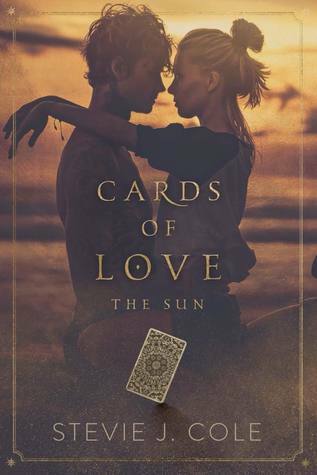 Cards of Love: The Sun is EVERYTHING!!!!! Did you hear that- everything!?!?!?!?!?!?!? It is an epic love story. EPIC LOVE STORY. An epic love story is one that any and everyone can connect to in some way. The Sun is epic. Pardon my slobbery drooling over this book. I get you aren't there yet but you will be. Elias Black is the dream. ( I know his faults but listen!) He is the broody misunderstood boy of your yo I swear I'm not biased. Hear me out before you judge my version of sloppy tongue kisses. It is an epic love story. EPIC LOVE STORY. An epic love story is one that any and everyone can connect to in some way. The Sun is epic. Pardon my slobbery drooling over this book. I get you aren't there yet but you will be. Elias Black is the dream. ( I know his faults but listen!) He is the broody misunderstood boy of your youth. He is the secret crush you had in second grade. He is the fairy tale best friend turned boyfriend you always wished for. The secret crush on the guy next door kind. (Don't fib,we've all had them.) He is the childhood dreams mixed with hormonal teenage fantasy. But the icing on the cake...his undying, unconditional love. That right there ladies and gents, is some Noah notebook, kind of love. Epic doesn't mean painless. It doesn't mean unicorns shitting glitter. Epic survives. Epic grows. Epic can't help but love. The Sun is EPIC. There are so many incredible quotes that I had to share. I have a freak chat thread dedicated to them but I cannot share them. I almost think it would cheat you out of the feels. So know that if you need to chat and share THE QUOTE that did you in, or the other 600, you marked. I'm your girl. But remember, Elias is mine....but I share him with Sunny. Also I am desperately begging the author to consider Elias Black shirts. Legit, t-shirts that say I <3 Elias Black with tattoo sleeves!!!! Help me make this happen!!!! I'm not above begging! You do not know how long I have pain-stakingly waited for this book. Forever. That's how long. I was so incredibly excited to get it, I couldn't wait to dig in and devour the words of Stevies latest book. Oh god. That one sentance showed me just how much this book was going to hurt me, but like always, I knew Stevie would put me back together again. It begins with Sunny and Elias as kids, it's so incredibly cute and I did nothing but smile rea You do not know how long I have pain-stakingly waited for this book. Forever. That's how long. Oh god. That one sentance showed me just how much this book was going to hurt me, but like always, I knew Stevie would put me back together again. It begins with Sunny and Elias as kids, it's so incredibly cute and I did nothing but smile reading them. I liked that the author actually wrote them as kids, not kids with thoughts about things they would never understand. They spoke like children, they played like children. They were happy. And then it hurts. I had a feeling it was coming but I didn't know how. Stevie has a way of sucking you into her story and getting you to love her characters so when their heart breaks, yours does too and that's exactly what happened to me. This story was so beautifully written that I felt the need to want to protect these characters. And I like how the author added tiny little details to the story that at a glance you wouldn't necessarily notice. Even the side characters played a big part in this book and I fell in love with each of them, even if they annoyed me at times. "After all, the sun and the moon were never meant to share the same sky." My emotions were all over the place with this one. It was so sweet but heartbreaking at the same time. I didn't just read about 2 characters trapped in a forbidden love, I read about a whole bunch of characters who acted through loyalty, pride, hate, fear and love. Each character had their own story to tell and Stevie made sure they got a voice too. If you take anything away from this story then let it the realisation that this is not just a book, a story. The actions of characters in this book are very real, it's the world we live in and that's what made me cry, when I realised that these words are just an extension of a world we already live in. There's an important message here, don't miss it. Stevie broke me, but through her words, she made me see the silver lining in horrible situations. That there are still parts of your life that are yet to be written. “I was a girl who fell in love with a boy who fell in love with me, and the most beautiful thing of all in life is that there is always a part waiting to be written. A story that seems like the cliche, bad boys meets good girl and then you read it and see there is nothing cliche about this story. Meeting when they are young, Sunny and Elias form this complex sort of relationship with each other. Sunny is the sun and Elias the moon, destine to share the same sky but never be together. Sunny is from a good home and really beats to her own drum. She doesn't do things because others think she should, doesn't dress the way others do and is just herself. She is the "good-girl" from the right side of the tracks. Elias on the other hand is the kid no one wants. He comes from trouble and to everyone he will grow up to be nothing but more trouble. While he doesn't always do things that are squeaky clean he really has a heart of gold and tries beyond anyone's expectations to be more. Such a beautiful cover for the young adult romance that is THE SUN by Stevie Cole! An emotional young love story with a forbidden kind of feel to it. It’s intense and angsty and spans years from their first encounter to when they meet and find one another again after some time has passed by. There’s a lot of drama going on, as typical for YA stories, along with mis- and plain missing communication, down to the virgin hero. There’s just something swoon-worthy about that, but it looks like I’m slow Such a beautiful cover for the young adult romance that is THE SUN by Stevie Cole! An emotional young love story with a forbidden kind of feel to it. It’s intense and angsty and spans years from their first encounter to when they meet and find one another again after some time has passed by. There’s a lot of drama going on, as typical for YA stories, along with mis- and plain missing communication, down to the virgin hero. There’s just something swoon-worthy about that, but it looks like I’m slowly outgrowing these type of books, because it gets tiring for me. Anyhow, the taboo-ish theme with the good sheriff’s girl falling for the bad boy from the wrong side of tracks kept me flying through the pages. I adored Elias’ maturity that went beyond his age – despite his bad boy tendencies and such –, which kind of made up for the lack of the same when it came to Sunny. The Sun is an emotional and heart warming story that will remind you of the power of true love. It's ugly, raw and beautiful. I promise once you read the book, you will understand why I chose this quote. On surface it makes it look like Elias and Sunny weren't meant to be together but the truth is that they they do. They are two people who have loved each other since an early age in childhood but life has gotten in the way. The Sun is an emotional and heart warming story that will remind you of the power of true love. It's ugly, raw and beautiful. I promise once you read the book, you will understand why I chose this quote. On surface it makes it look like Elias and Sunny weren't meant to be together but the truth is that they they do. They are two people who have loved each other since an early age in childhood but life has gotten in the way. It's up to them to figure out if it's worth the heartache and pain. I think what I liked most about this story is just how amazing Elias really is. Sure, he's the bad boy now but you know, deep down, that he's the most loving and caring person who has a heart of gold. His love for Sunny is one of those epic loves that everyone is constantly searching for. If you are looking for epic love that spans from childhood to adulthood then you don't want to miss out on The Sun. Heads up, because of the nature of the age range and their actions associated with that, you'll want to smack some people around but in the end you still love them. That is what this book was. Stevie captures my heart from the very first page and left me blissfully happy and full of love after I had finished. My god, Elias and Sunny...they stole my breath. Their love. So pure and never ending, they’re were the epitome of soul mates. Forever meant for each other, no matter how much people and society tried to keep them apart. I could read these two beautiful characters forever. I absolutely loved them, and their hearts. A brilli Amazing. Amazing. Amazing!!!! I'm balling. I started this book with tears and here we are. This was a beautiful young adult story. It warns of young love and the tumultuous relationships between teens and parents. It questions whether you can truly find love and sustain as a child. Sunny and Elias were sweet kids who met while Elias was being fostered by her parents. They grew close and then we're sep Excellent! Sunny and Elias were sweet kids who met while Elias was being fostered by her parents. They grew close and then we're separated when Elias went to live with his drug addicted Aunt. The two never forgot one another and kept in sparse contact threw out the years. Upon Elias's return, Sunny's father, who once thought the world of Elias, now deemed him "not good enough" for her. This puts weight on Elias because he already felt that way. I think I have came up with a new nickname for Stevie. "Angst Queen" This book literally had so much angst and tension I was in tears for a lot of it. I felt every single word in my heart and some of them I thought would literally rip me to shreds. Elias and Sunny are the epitome of young love going the distance. Although this book was not overly sexual it was a beautiful story. One that I will remember forever. Easy to recommend. Easy to get lost in. Easy to just set back and go on the ride. I honestly do not know where to start. The book was just purely beautiful! It made me feel so many different emotions. The Heroine (Sunny Ray) is a good girl from a middle class family. Her father is the towns sheriff and they are a very religious town. The Hero (Elias) is a tattooed bad boy from a poor background. He went through a lot in his life and did what he had to to provide for his twin brothers. Their relationship spans many years. We see how it develops and what they have to go through I honestly do not know where to start. The book was just purely beautiful! It made me feel so many different emotions. The Heroine (Sunny Ray) is a good girl from a middle class family. Her father is the towns sheriff and they are a very religious town. The Hero (Elias) is a tattooed bad boy from a poor background. He went through a lot in his life and did what he had to to provide for his twin brothers. Their relationship spans many years. We see how it develops and what they have to go through to be together. Their relationship is forbidden so it makes it all the more difficult and delicious. They went through quite a lot of misunderstandings and pain yet they never stopped loving each other. 4.5 emotional and heartfelt stars! I absolutely ADORED this book. Every single character in The Sun had a story to tell and was well written. Elias is a uniquely written and fierce loving character who will make you swoon from the first few pages. Just a really fabulous YA / coming of age story. Solid story with just the right amount of angst. I loved that Elias & Sunny always held on to hope that they’d be together. This would’ve been a five star read, but i wanted more of a closure on some of the secondary characters. Like what happened to Daisy or Elias’ brothers. They weren’t mentioned at all in the epilogue. A happy, sweet girl with loving parents who wants a brother to play with. A boy who lived in a house where his father broke the toys donated by the church, where fights and shouts were a constant, until his mother leaves, his father is arrested and he and the brothers are in foster care. And since her parents can no longer have children and wish to help other children, the girl's dream comes true, and she ends up winning a brother. A temporary family, but that will take care of the boy with much love and affection. And so Sunny knows Elijah. And in the blink of an eye, she realizes that everything she imagined will not happen. Elijah was not what she expected. The quiet, cocky and sometimes wicked boy in one night will show Sunny who he really is, and from then on they will be inseparable. An innocent, beautiful and pure friendship will be born. Until they will be separated. Only the memories and a ring of moon and sun will remain. Years later, the two will meet at random in a place that has a meaning for both, and all feelings will surface. The two never stopped thinking about each other, they spent years in love. Until a misunderstanding and confusion will separate the two again. Willing to keep in touch this time, letters are written and the relationship remains. Until a fateful letter, with a short sentence, will break Elijah’s heart. Time passes, and back in the city, the boy Sunny knew certainly is not the same. Elias decided to embrace what everyone was saying about him and really became a bad boy. And with more secrets, things not spoken, threats from Sunny's father, this couple will have to fight hard if they want to be together. Can the sun and the moon, so opposites, be together? Or are they bound to always be apart? Prepare the tissues, they will be needed. The Sun is a heavy, dense book, the trajectory of the characters is not easy, too much drama, many hindrances. And one certainty. The golden girl, the good girl, loves with all the heart the bad boy. And he loves her more than life. Elijah had a very hard life. From an early age he learned that he could only count on himself to raise his brothers. No adult in his family was trustworthy, it was difficult to survive to this point, he did not make the best decisions, but he did his best. Sunny loves this boy, now a man. But her family is very different from her. Living in a small, religious town, any step is portrayed to her father, the sheriff. It's hard for her to realize that her parents are human after all. What they preach is not what they really believe, at least as far as she is concerned. Daisy and Brandon make good characters too, though I think Daisy has made her own destiny. It was very clear what kind of person her boyfriend was. Brandon broke my heart because he could not be himself, could not love freely for fear of others reaction. Sunny and Elias provoked laughter, tears, grief, and much love. The journey of the two is filled with ups and downs, with much sadness and separation, but in the end love is greater. The end of the characters is bittersweet. It's very real, it's not a cliché ending to romance, which struck me. The end stayed with me for a long time, until I could digest. All of them lost and won. Everyone gave up something. Everyone blames themselves for something, some more others less. Happiness is not one hundred percent guaranteed. There are obstacles and losses along the way. Just like real life. A sensitive, strong book that provoked unexpected and shocking reactions. I was the sun, and he was the moon, and while we may share the same sky during the early hours of dawn, we would never be close enough to matter..... I mean wow!! Stevie had so many good quotes from this book and just WOW moments for myself. I loved this book. Elias and Sunny were meant to be. Loved the storyline, the flow, characters and well dangit just everything about it. "The heart is only meant to love one person." I mean really this is a teenager saying this. These two knew they wanted eac I was the sun, and he was the moon, and while we may share the same sky during the early hours of dawn, we would never be close enough to matter..... I mean wow!! Stevie had so many good quotes from this book and just WOW moments for myself. I loved this book. Elias and Sunny were meant to be. Loved the storyline, the flow, characters and well dangit just everything about it. "The heart is only meant to love one person." I mean really this is a teenager saying this. These two knew they wanted each other and everyone else be damned in the end. I really loved reading Elias and Sunny's journey to their ever after. It had everything to angst, laughter, bittersweet moments and lots of teen angst too. I would even like an update about Daisy and Brandon in some point in time I loved their characters too. so hint, hint, and wink. One last phrase I loved before I go and well just enjoy it and please read the book. I'm an avid reader and highly recommend this read. Life was about stolen moments that harbored no real significance but made you feel alive.....love, love, love this. And I hope you all do too. To say I feel in love with this amazing story would be an understatement. This story touched me in a way that I almost can't put into words, but I'm going to try. The Sun was an emotional young love story, a Romeo and Juliet type forbidden romance. It spanned years between when Sunny and Elias first met and then finding one another years later. As most adolescent story goes a lot of things and drama, who likes who and who's dating which guy even sexuality played a role. Elias is from the wrongnside of the tracks but Sunny sees him differently and beyond. Her father disliked them together so young so there was a lot of sneaking around. But their feeling are solid and true even over the many things that happened in their youth. Lessons learned along the way. Of course one heck of a love story too, Sunny is that piece of brightness in Elias bleak life. Stevie Cole sure knows how to pack a punch in a story. This was a goodread, a coming of age with a different take on Romeo and Juliet chocked full of great quotes to highlight. A story that so many of us have read about the daughter of the small-town sheriff and son of a convicted murderer. They build an unbreakable bond at the young age of 8, though some things aren’t always meant to be. Sunny struggles with her parents telling her not to judge a book by its cover, all the while judging Elias by the path his parents traveled. And for the first time in a while, I got misty eyed. For a good teen agnst romance, I would seriously recommend this book. Quick intense read, the author just sucked me in and played games with all my emotions. Heartfelt,heartbreaking and emotional story about Sunny and Elias. Theirs is one of those stories that builds up and slowly unfolds secrets giving you details that makes their romance so unique and unconventional. The Sun is part of Cards of Love massive multi-author project. Each read is part of a series of love letters to the mysterious and inspirational wo Quick intense read, the author just sucked me in and played games with all my emotions.